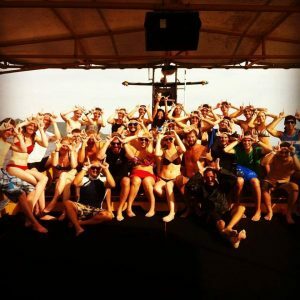 Live the Dream – Become a Divemaster on Koh Tao! To be a PADI dive master means, waking up every day to clear blue skies and driving to work on a motorbike along a palm tree-lined road to a wide white sandy beach, dotted with long tail boats. 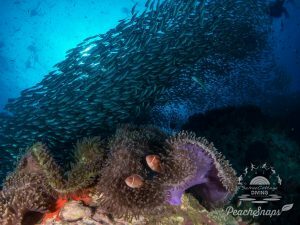 Next, you meet your friends and scuba divers, and together you spend the morning diving amongst schools of barracudas and other tropical reef fish! On a good day you will encounter a whale shark or other pelagic giants. In between the dives you will be listening to music and enjoying platters of fresh fruit. As a divemaster you will spend your afternoon relaxing in your hammock on your balcony, or hanging out on any of the pristine beaches or at the pool bar. 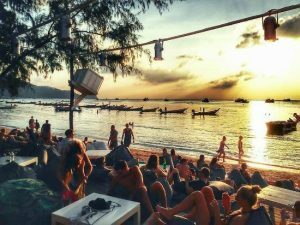 You mull over the seemingly endless dinner options – Thai, Western, street food or gourmet, as you enjoy another perfect sunset and an ice cold beer. After dinner you head back to the beach and enjoy a fire show, and either head out to dance at the plentiful bars along Sairee, or call it an early night and head home to your bungalow, full, tired, and happy! This is no imaginary life! This can be YOUR life when you join our Divemaster training program in Koh Tao!